The word “student” might be a synonym of youthful imagination and seemingly inexhaustible energy reserves, but it often also means someone with a wallet too big for its modest contents. Regardless of the budget, students will probably find other things to spend their resources on than fine dining - and here is where the list of locales offering good, hearty and modestly priced food really comes in handy. Kombinat is a tapas bar where we order small portions at a very friendly price. No ready, no chemistry. Instead of artificial flavors, the combination uses herbs from its own greenhouse, and instead of carbonated beverages, it produces its own lemonade. All it takes is a few zlotys to eat well and just the same amount to order a bottle of refreshing drink. The Kombinat completed the interesting offer of Kościelna Street, becoming one of the icons of Jeżyce with time. The offer of the premises includes tasty breakfasts at a very good, student price. We recommend it any time of the day! The Pierożak is a nice little place on ulica Wrocławska, located just two minutes walk from the Old Market Square. Only dumplings made on the spot are served here. The open kitchen space allows you to follow the life of the dumplings from its birth, until the tasty finale on our fork. Dumplings can be bought on pieces, mixing the fillings available on the menu. The offer includes traditional fillings, both sweet and dry as well as seasonal experiments. At the time of serving, we only wait for the cooking of raw dumplings, that is several minutes. There is no problem with buying take away dumplings. Undoubtedly, this is one of the best pierogi of Poznań. We recommend! Pyra bar was created as a loke addressed to the young generation looking for a decent kitchen at a reasonable price. Pyra (this is a potato in Poznań) is the main ingredient of the menu. The menu includes potato casseroles, potato pancakes and a few other dishes displaying the culinary symbol of Wielkopolska. Small elements of humorous décor refer to the style of PRL, the restaurant itself is a combination of a small, urban bistro with decent, modern fast food. It's a good place for a quick lunch and a visit with friends visiting Poznań. "Winklu" means in the dialect of Poznań "on the corner". 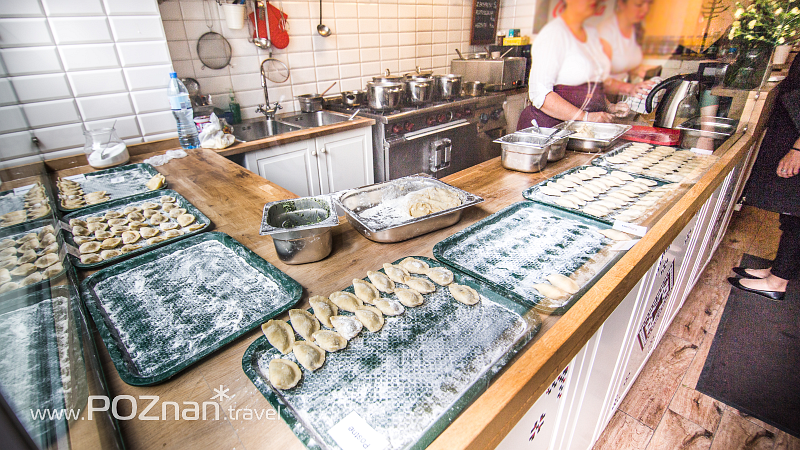 It was at the corner of one of the historic tenement houses in Poznań's Śródka that the dumpling was made. The smaller ones are cooked and the larger ones from the oven, all very tasty and recommendable. The restaurant also serves pastries, coffee and a wide selection of leafy teas. Na winklu is a good place for small and big hunger, for coffee and for gossip about sweet. The historic Śródka is often associated with Krakow's Kazimierz. I wonder how you like it? Dim sum is a description of various light snacks found in Chinese cuisine. Dim sum dumplings are delicate, steamed "pouch" of thin dough. They can be found in many Asian cuisines. There are a lot of ways to stuff them, and in Para bar you will find a dozen or so of them. After the move, which occurred at the beginning of 2017, the restaurant expanded its wings and expanded the menu in an interesting way. They are going full steam! Congratulations and we keep our fingers crossed for the next strong season. Domowa kuchnia Tylko u Nas (znana także jako „U dziadka”) wypracowała sobie w Poznaniu solidną renomę. Menu do złudzenia przypomina babcine obiady, a solidne porcje bez trudu zaspokoją apetyt bez obawy o zawartość portfela. Czasem warto zamówić pół porcji, bo cała może Was pokonać. Tu „mały schabowy” wygląda jak duży, a „duży schabowy” zasłania słońce. W lokalu jest zawsze tłoczno i gwarno. Na porządku dziennym jest dzielenie stołu z nieznajomymi, co wynika z ciągłego oblężenia tego miejsca. Lokal pozostaje w naszym zestawieniu utrzymując doskonałą formę kulinarną i atrakcyjne ceny. Domestic kitchen Only with us (also known as "At grandfather's") has earned a solid reputation in Poznań. The menu is very similar to grandma's dinners, and solid portions will easily satisfy your appetite without worrying about the contents of your wallet. Sometimes it's worth ordering half portions, because the whole can beat you. Here, the "small pork chop" looks like a big one, and the "big pork chop" covers the sun. The place is always crowded and noisy. It is common to share a table with strangers, which results from the constant siege of this place. The restaurant remains in our list, maintaining an excellent culinary form and attractive prices. Spaghetteria Avanti on the Old Market Square serves Italian cuisine: spaghetti, lasagna, pasta casseroles, salads and salads. Every morning, fresh sauces, salads and starters are prepared in the local kitchen. Spaghetti and other pastas are cooked up to date so that they are "al dente".